This is a short, casual photo essay introducing several student makers on campus. 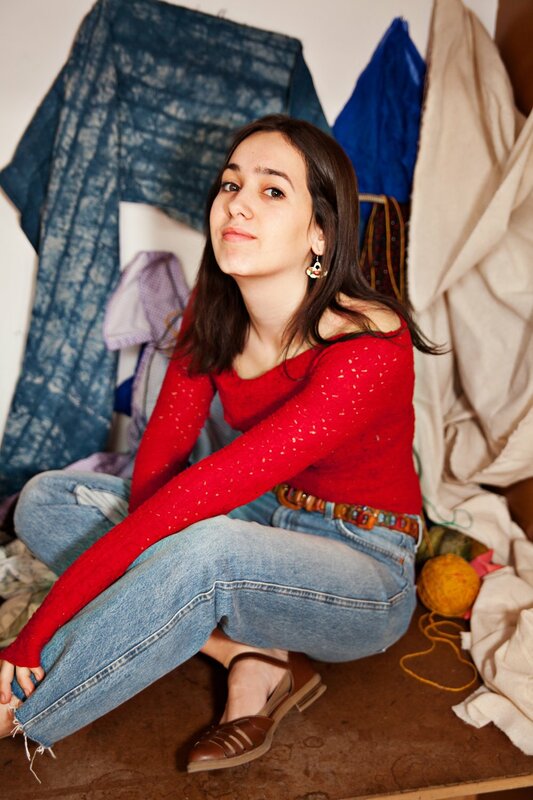 Take a look into the spaces where we cut up, sew, and/or alter our own clothes. Each of us donned an outfit that we felt best represented our personality, talked a little bit about our favorite colors, and explained the creative process behind pieces we’ve made. My favorite color is green; I’m usually knitting green or blue articles. I think I’ve always been drawn to emerald green in particular because it’s my birthstone. In photography, it’s also an uncomfortable color that is hard to successfully capture. If you’ve ever seen Atonement, the actress wears a green dress and it looks amazing. You won’t see it in movies often though; they avoid green because it doesn’t go well with skin-tones. If you do it well, you can make a big impact. I made this (red) shirt during my junior year or high school, when I was really into thrifting. I’d buy clothing and alter them at home with my mom’s sewing machine. The top started out in a standard t-shirt shape. Boat-necks were trendy at the time though, so I cut off the top and added darts, making it more form-fitting. I wore it a lot in high school, and I still wear it today. My favorite color is pink but I never wear pink, I never do anything with pink. I like it on walls or objects, but not necessarily on bodies. I’d say I’m much more interested in form and the way you can cut the fabric than in color or pattern. In Japan, for dress, you have kimonos (which are silk and flowy) and you have yukatas (which are basic kimonos that are made out of cotton). This (red jacket) was a yukata, which is more informal. When I got this piece as a kid, I wore it all the time. I grew too big for it when I turned 7. This summer, when I went back home to Brazil, I rediscovered the piece and altered it into something I could wear again. The original piece had long armholes and strings hanging off the side to tie the dress together. I removed the strings, sewed up the old armholes, and created new sleeves, so now it looks like a fitted jacket. I’m really inspired by designers that remake traditional Japanese fashion into more practical or contemporary styles. My favorite color is sky blue. In addition to this dress, you’ll probably notice that a lot of my wardrobe is blue, gray, or green. And I also love florals. Anything floral. This light-up dress has a starry night motif with an asymmetrical high-low cut. I included a bubble hem (the hem that folds under) in the design, which I found out doesn’t really form easily with cotton. But it is what it is, and I actually really enjoy how the shape turned out once it came together. The dress is inspired by a piece that Janelle Monae wore to the Golden Globes awards show. It was also an asymmetrical high-low bubble hem white full skirt with multi-size black polka dots, had black netting over-casing the skirt, and topped by a dark, fitted bodice. I loved that shape and wanted to try emulating that to the best of my abilities. My favorite color is firetruck red, but I have a tendency to douse myself in a pool of different colors and patterns all at once. What I wear mainly depends on my mood. Sometimes, I wake up in the morning feeling much more polka-dotty than usual, so it only makes sense to also put polka dotted print on my body. Some days I wear sad and dark colors, and other days I wear fun chicken-patterned dresses. I love clothing because it’s such a wonderful way for us to express ourselves. I like to collect found materials and sew them into impractical hats, headbands, and stuffed animals. For the black apron, I started out with the long standard apron that they gave out to everyone in the visual arts department. It came already embroidered with my last name on it, so I thought it would be fun to personalize it even further by bejewelling it. I added sequins, shortened the length, and sewed on beads. It’s become an object of sentimental value. I typically stick to neutral and muted colors like navy or gray so my clothes appear more “functional,” but I sometimes do enjoy these colors with a small pop of bright or neon colors or vice versa. I enjoy certain colors better when I see how they balance out other fabrics and patterns. I’m pretty open minded when it comes to a color palette because there are so many different combinations that are beautiful. For my senior thesis, I’ve been reconstructing and repurposing clothes that I’ve bought from fast fashion retailers to make new garments. For my IKEA bustier piece, I wanted to make something ironic that hinted at the cheap means of production. IKEA is a utilitarian brand that is meant to be anti-fashionable, so I made a fashion statement by turning their $0.99 shopping bags into a bustier top. I assembled the IKEA design on top of a plain bustier top that I bought at a fast fashion retailer that was marked down by 85% for $3. I used scissors and a sewing machine to construct the piece together, deliberately creating imperfections with some jagged edges. 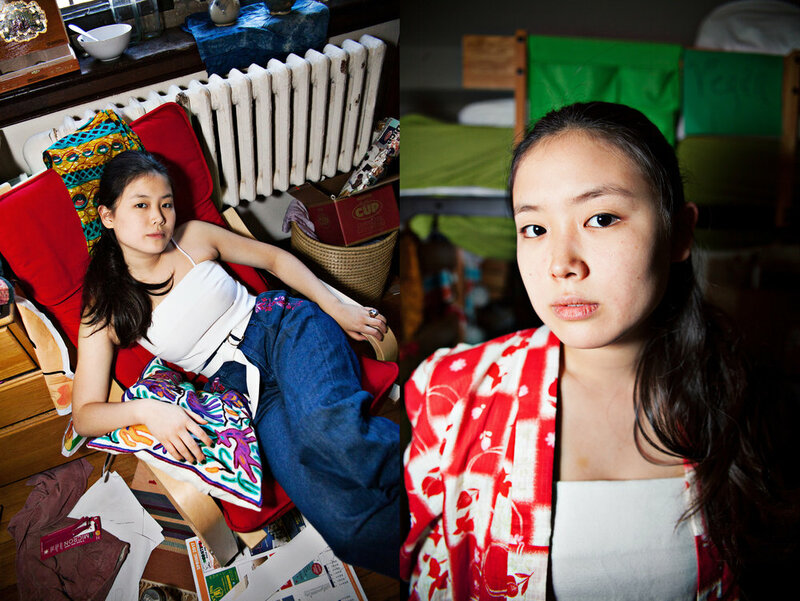 Helen Lin '18 is Photoshoot Editor of Stripe Magazine and a Visual Arts major of Princeton University. Helen was born a heavy dreamer. She loves to use clothes and accessories as a medium of self expression. She likes to describe her style as "poisonous frog" fashion, perpetrated through a hodge podge collage of loud patterns, textures, colors, and earrings. She often makes mixed media artwork about dysfunctional relationships, guilt, and human curiosity + appreciation for the natural world. She also likes to nap.